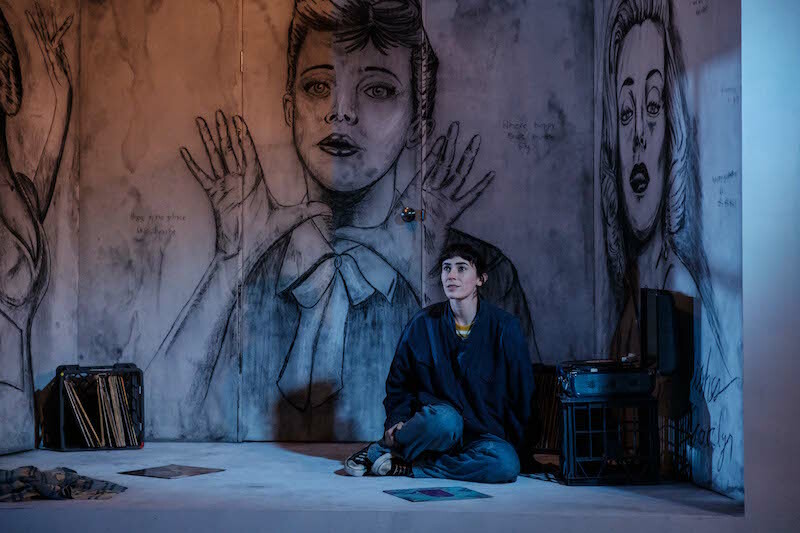 Geraldine Hakewill breaks your heart in the Darlinghurst Theatre Company production of The Rise and Fall of Little Voice, her silent scream near the end of the play ricocheting through you as she clutches the broken records that have until now been the centre of her life. Her pain cuts to the quick. Jim Cartwright wrote the play in 1992 for Jane Horrocks having realised that she could summon the voices of various iconic singers in uncanny fashion. Horrocks later starred as Little Voice, or LV as she is known, in the 1998 film Little Voice with Brenda Blethyn as her blowsy, working-class mother Mari. The play begins with a flash as the lights fuse yet again. Mari (Caroline O’Connor) has staggered home after another drunken night – but this time (she fervently hopes) she has landed a new boyfriend, a two-bit talent spotter and manager called Ray Say (Joseph Del Re). Now Mari is having a phone fitted so that he can call. Meanwhile, her daughter LV hides in her room upstairs listening to her precious LPs of famous singers like Judy Garland, Shirley Bassey, Billie Holiday and Edith Piaf, left by her late father. LV is painfully shy, driven almost mute by her selfish, domineering mother. But when she sings, the voices of the women on the records power through her freely as if she is possessed. When Ray hears her sing one day, he is determined to put her on stage, make a star out of her and make a motza for himself in the process, regardless of the fact that LV doesn’t want to sing publicly. Set in the north of England, The Rise and Fall of Little Voice is a contemporary fairytale about a girl finding her own voice, with references to Cinderella and plays such as Pygmalion, A Taste of Honey and Educating Rita. It has dated somewhat since it premiered, with umpteen television talent shows doling out sob-stories about people doing it tough who come to life when they sing, but it still has a gut-wrenching heart in the struggle of its two central women. Shaun Rennie directs the play for Darlinghurst Theatre Company, on a non-naturalistic set by Isabel Hudson. LV’s bedroom is a stark white room on metal legs, with sketches of some of her idols on the wall, while the shabby house spreads out below with a fridge, an old sofa and a double mattress on the floor. 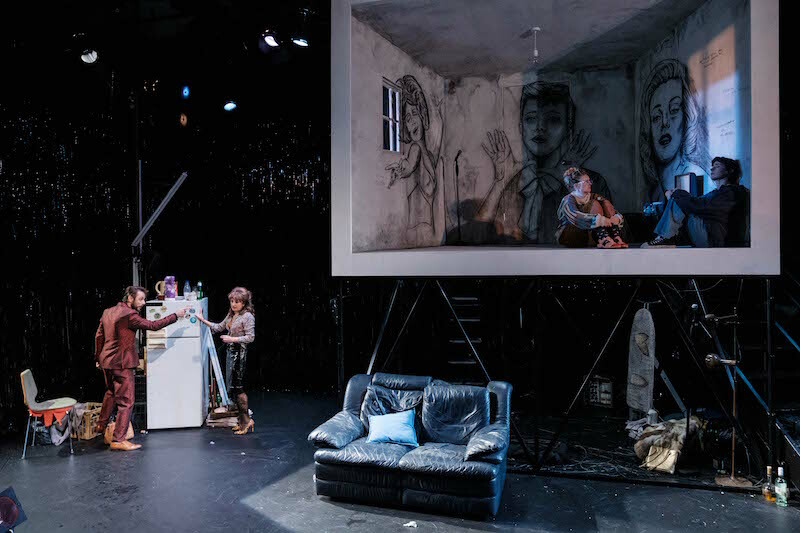 Though the set looks striking, it makes for some awkward scene changes and feels rather too self-conscious at times, working against the authenticity in the play. Rennie’s production lands most of the major moments. Hakewill is agonisingly good as the awkward LV, stammering when she is forced to speak, her body contorting with the words. And when she sings she soars. She moves brilliantly between the voices of Bassey, Garland, Piaf and Marilyn Monroe, capturing their different vocal nuances. She may not mimic them all perfectly but she does jolly well, and is utterly convincing as a young loner with a special gift, who would have blown away the audience at the local club. When she finally lets rip at Ray, with phrases from various songs tumbling out in manic, traumatic fashion, she is astonishing. O’Connor also has Mari down to a tee. Wearing mutton-dressed-as-lamb outfits that are tight, tawdry and revealing, she is a monstrous blast of feral energy. She’s funny and ferocious, capturing Mari’s vulgarity while conveying the desperation lurking beneath. Her emotional confession to LV is moving, and when she finally faces all that she has lost at the end, her engulfing pain feels real and raw. The production doesn’t quite find the nuance in the relationship between Mari and her goofy, sugar-loving neighbour Sadie. Bishanyia Vincent does well with what she is given but the character feels a bit swamped; I recall Sadie being funnier and justifiably angrier at times in a previous production, while Mari’s curt dismissal of her was sadder and more moving than it is here. Del Re feels too young for Ray but he does a solid job in the role, really hitting home when he lashes out at Mari with the brutal truth. Charles Wu gives a touching, beautifully understated performance as the shy, gentle young phone engineer Billy who falls for LV, while Kip Chapman finds the comedy, and some of the menace, in the club owner Mr Boo. But the night belongs to Hakewill and O’Connor who torch their roles and make for a moving night. Rohan Browne leads a talented cast in this energetic, crowd-pleasing take on the 20-year-old Australian musical. What if Frida Kahlo and Leon Trotsky had a child? Natalie Gamsu finds out in this unusual cabaret show. Hugo Weaving's brilliant Arturo Ui is terrifying because he's familiar. Peter Evans’ stylish but faceless production has a saving grace in two of its principals. From Raoul in the West End to the Tin Man in Australia, the versatile leading man chats about Lloyd Webber's Wizard of Oz and his own debut album. A new stage adaptation of Dickens' classic novella introduces Playschool and zombies yet retains the heart of the original. Mitchell Butel has gathered a starry line-up of leading ladies to play Fanny Brice in a Sydney Symphony Orchestra concert of Funny Girl. Highlights include Blazey Best in Gypsy, a revival of Australian musical Darlinghurst Nights, Aspects of Love, and In the Heights. This cinematic take on the Scottish play lacks some substance but is far from signifying nothing.